Created Ambition One Ltd (a joint venture between Ambit & Evolve Fund Services) will be developing an industrial scheme (B1c, B2 & B8 uses) extending to approximately 23,650 sqft arranged in 7 units. Each unit will have an eaves height of 6m and share 47 car parking spaces. Agents – Glenny (01268 540771), D.wink@glenny.co.uk. 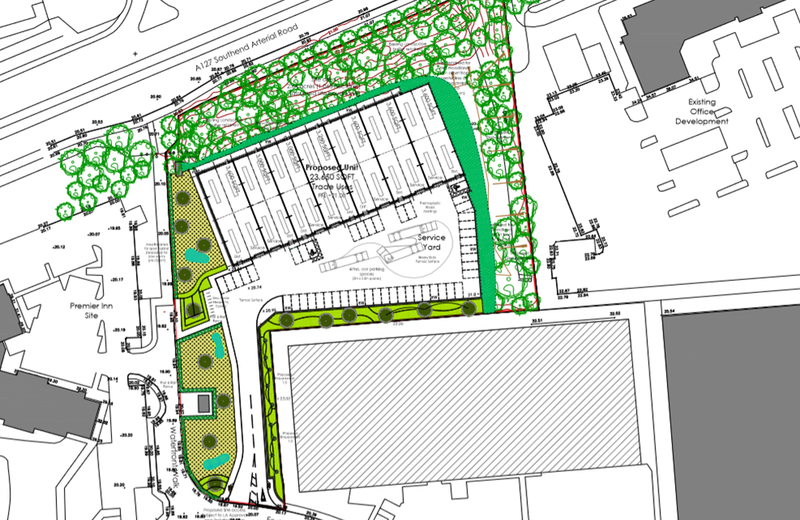 The current layout shows the 7 units, car parking and access/egress via Festival Way. At this stages changes can be made and specific requirements catered. The scheme is situated within the established commercial area of Festival Park a short walk from the restaurant and leisure facilities. The units back onto the A127, one of the main Southend to London routes. Access to the park is via Cranes Farm Road (A1235) the main feeder route linking Basildon’s industrial estates. The centre and railway station are within 2 miles.